​easySCRUB's microstructure is the magic behind its cleaning performance. It works by lifting and trapping bacteria. The anti-bacterial agent in the cavities then acts to kill the bacteria. The foam and IPA facilitate removal and absorption of CLABSI-causing bio-agents more effectively than current technologies. The surface-conforming nature of the easySCRUB sponge-like foam allows it to better reach between the threads of the luer lock and clean the septum with greater consistency and efficacy. ​Capillary forces then draw the removed infectious agents into the open-cell foam for immediate disposal. As a single-use cleaning sponge, the easySCRUB technology is classified as a LOW RISK, Class I medical device. Therefore, easySCRUB can be rapidly implemented in pediatric clinical settings with minimal regulatory impediments. For medical practitioners, the easySCRUB technology is used just like current IPA towelettes, where the caregiver simply twists, with pressure, the easySCRUB foam block around the luer lock. 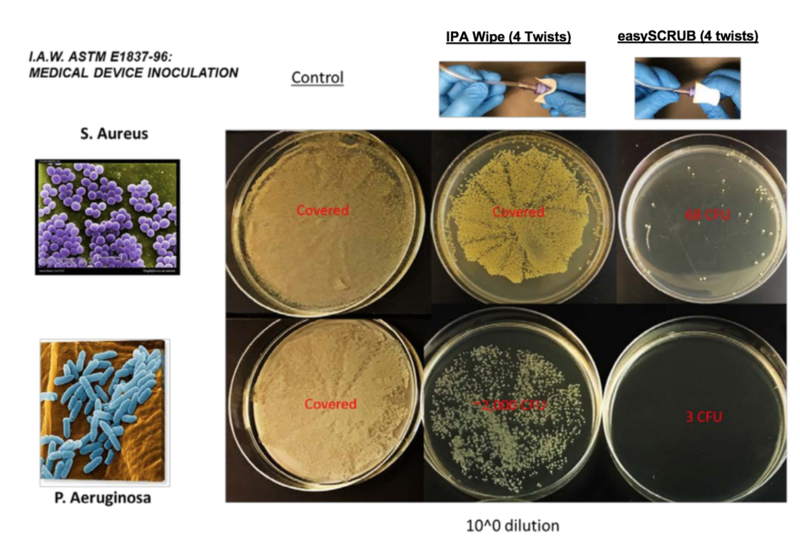 ​Initial proof-of-concept tests of the easySCRUB technology against two strains of bacteria prevalent at causing pediatric hospital-acquired infections (Staphylococcus aureus and Pseudomonas aeruginosa), reveal that the microabrasive nature of the easySCRUB foam removes several orders of magnitude more bacteria colony forming units (CFUs) from the luer lock when compared to a typical non-woven IPA prep pad under identical ASTM-E1837-96 “Standard Test Method to Determine Efficacy of Disinfection Processes for Reusable Medical Devices (Simulated Use Test)” conditions. ​The key value proposition of the easySCRUB technology is that even if there is significant non-compliance with STH protocols, disinfection of the IV is still achieved under even the most minimal maintenance conditions – as in this demonstrated case after only four “twists” of the disinfecting technology upon the luer lock (image above).